For the Berry-Yogurt Popsicles: Place the strawberries, raspberries and sugar into a food processor such as a Cusinart fitted with a blade attachment, puree until well blended. Add the yogurt and blend on high till smooth. 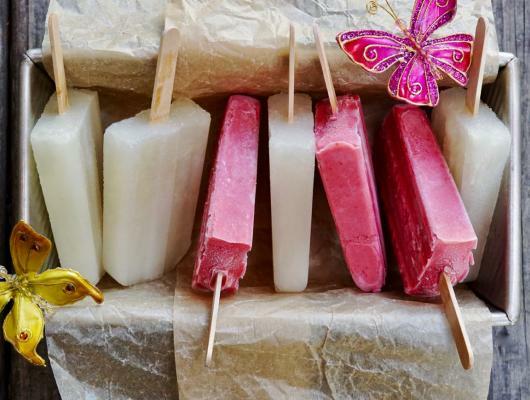 Pour the fruit-yogurt puree into 5 slots of a 10 slot popsicle mold. Set aside. For the Coconut-Lime Popsicles: Place the frozen limeade and coconut water into a food processor such as a Cusinart fitted with a blade attachment, blend well. Pour the lime-coconut mixture into the remaining 5 slots. 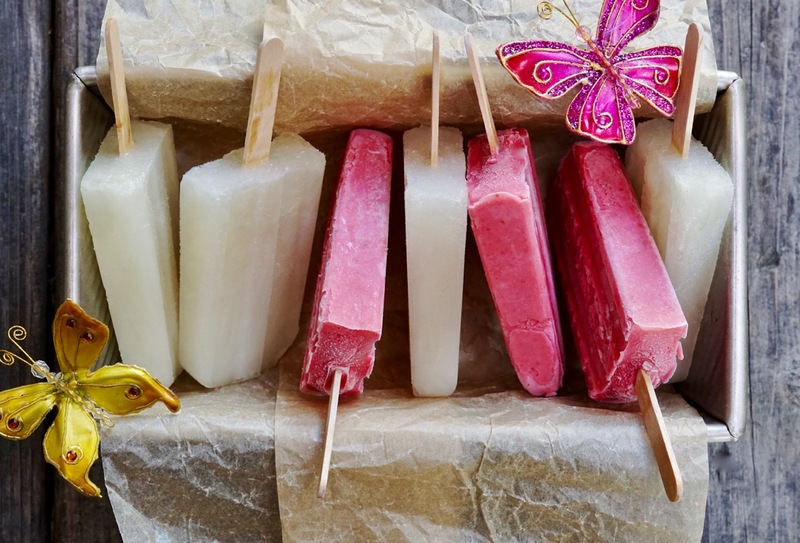 Place the filled popsicle mold carefully into the freezer and allow to freeze for about 30 minutes. After 30 minutes insert the popsicle sticks into the mold. Be careful not to push the sticks in all the way, leave about 1 1/2-2 inches sticking out. Place back in the freezer and allow to chill undisturbed for at least 12 hours, or overnight. To serve, run the whole popsicle mold under warm water to loosen. Gently pull each popsicle from the mold. Serve immediately.